Sunnyvale & Santa Clara- Smash Gyms has morning MMA training from 10:30am-11:30am Monday through Friday! These beginner friendly MMA fitness classes are a great way to improve your overall fitness and functional strength while learning self-defense. The MMA class participants range from professional & amateur fighters to stay-at-home moms. In this fun and unique fitness class participants will learn techniques, drills and workouts borrowed from a variety of disciplines. The morning MMA class teaches techniques from Boxing, Kickboxing, Jiu-Jitsu, Wrestling, and Judo. The wide variety of class formats, strength and conditioning exercises and fighting styles makes a fun and exciting class to help keep our members interested and motivated. This class has a strong emphasis and safety and welcomes all skill and fitness levels. All of our group fitness and exercise classes at Smash are all beginner friendly. The 10:30am MMA class is perfect for students, people with flexible work schedules, housewives, or anyone that sneak out of work! Immediately following the MMA class is a Noon Jiu-Jitsu class five days a week. 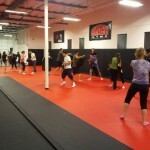 The Lunch time fitness and BJJ classes are some of the most popular classes at Smash! Lunch time classes include Bootcamp, Kettlebell, JuJitsu, MMA, Kickboxing and more. Student discounts available! Smash is located on the border of Sunnyvale and Santa Clara. Just 10 minutes from San Jose, Milpitas, Mountain View and Fremont. Try a Free Week of Unlimited Classes!